Often, logistics play a crucial role in the successful completion of an inspection and/or cleaning project. This was also true in the case of the Maghreb-Europe gas pipeline (MEG). MEG is a natural gas pipeline connecting the Hassi R’mel field in Algeria with Cordoba, Spain, where the product is distributed into the Spanish and Portuguese gas grids. Of the pipeline’s entire length of 1620 km, a 540 km section spans Moroccan territory, reaching from the Oujda region over Taza and Ouezzane regions to the Strait of Gibaltra at Tangier. This 48 in. pipe section supplies Morocco with gas, and is operated and maintained by METRAGAZ. 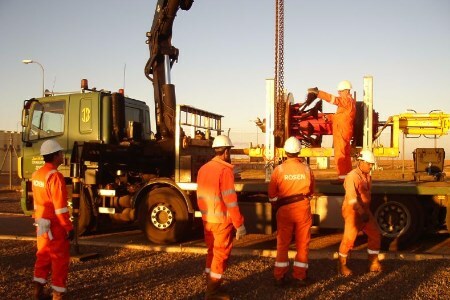 Earlier this year, METRAGAZ commissioned ROSEN to clean and inspect 365 km of the MEG pipeline’s Moroccan section. The contract comprised geometry and metal loss inline inspections (ILI), and also XYZ mapping of a significant section of the asset situated between M02 station and M18 station. Moreover, a fitness-for-purpose and corrosion growth assessment for all sections was to be provided. All related logistic operations, including lifting operations, were to be handled by ROSEN. Within two weeks of signing the contract, ROSEN was onsite with all necessary equipment, which included a 48 in. RoCorr MFL-A Service tool, two 48 in. RoClean CLP service tools, two 48 in. launching/receiving sets, a hydraulic unit, four spare parts sets, and all required lifting equipment. A professional transport company provided a crane truck and trailer to lift, load, and transport all equipment throughout the entire project.